Wow! We are so proud to announce our October Superhero of the Month, Carol Jacobs. If you haven’t met Carol yet, I’m surprised! She is a shiny bright star at Mo-Mentum who lights a room when she enters! Carol is one of the most energetic and positive people I have ever met. Her enthusiasm for life is contagious. 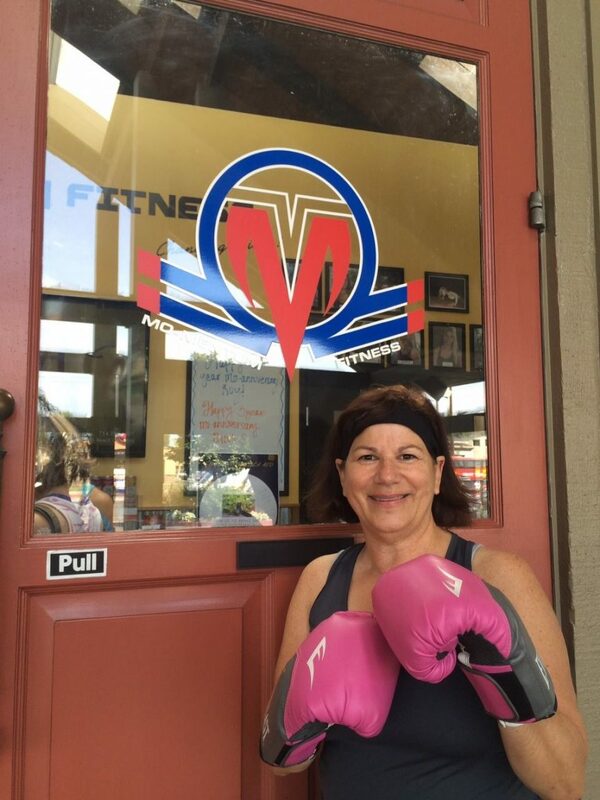 Carol has always been active, but never considered herself “fit” until joining Mo-Mentum Fitness. Since becoming part of the Mo-Mentum tribe, Carol has lost 10lbs, she has stopped taking her anti-inflammatory medications and has increased her strength and endurance. Recently Carol began taking weightlifting classes and while participating in Steve’s Deadlifting 10-week class she added 25 pounds to her deadlift! When Carol is not at Mo-Mentum, she is busy playing golf, tennis, and pickle ball, volunteering in the community, cheering for the Angels, playing with her dogs and spending time with her family. Why did you join Mo-Mentum Fitness? I have always been an active person but not a fit person. I enjoy competition and playing sports including tennis, golf, table tennis, and pickleball. I’ve even completed two marathons! However, I did not enjoy exercising without a game being involved. Prior to joining Mo-Mentum Fitness, I had very little energy and lots of aches and pains. I live very close to Mo-Mentum Fitness and had always been curious what type of activities were offered there. I did some research online and was very impressed with the reviews and decided to stop by this past April. I spoke with Amanda and she was so encouraging and welcoming that I decided to do a trial membership. I was hooked. Now I am so much happier not to mention have more energy, met amazing people, my clothes are loser and I’m pain free. More importantly, Mo-Mentum Fitness changed my outlook on exercise. Now I look forward to a good workout and don’t mind being sore afterwards! What changes have you noticed since you started working out at Mo-Mentum? I’ve lost approximately 10 pounds since joining Mo-Mentum Fitness four months ago. I use to take a prescribed anti-inflammatory on a regular basis (every time I was exerting myself), now I rarely need to take it. My endurance has definitely improved, thanks to all the great instructors that push me. I feel more toned and stronger than before. I’m confident I will continue to meet my goals to be healthier and to improve my fitness levels. I’ve come to realize that in order to keep enjoying the activities in my life, fitness is a must. Going to Mo-Mentum has made me happier, healthier and given me a better focus on what’s important in my life. Stay active and stay consistent. Living a balanced life is critical – exercise, eat right, do random acts of kindness and do something you love every day! I am in love with Cutie Tangerines and almonds. I eat them every day and give me energy. Completing a box jump was something I struggled with and only recently was able to achieve this goal. It was all mental, but I finally did it! I feel unstoppable! Carol is a super hero to the core and an incredible inspiration! Congratulations Carol! !